London, 1777. Engraving by J. Zucchi. In excellent condition. An elegant engraving depicting two chimneys in Lord Derby's celebrated house in Grosvenor Square, London. Robert and his brother James Adam forever changed the face of British architecture by introducing innovative Classical design ideas. From 1754-57, Robert lived in Italy where he had a long productive friendship with Piranesi, which was inspirational for both men. Adam's first book, on Diocletian's palace in Dalmatia, is clearly very like the archaeological investigations Piranesi was making at the same time of similar ruins. Piranesi's friendship and passion for Roman Classicism were seminal influences on Adam, and the greatest single factor, other than his own talent, in the work Adam produced on his return to England. Upon his return, the brothers launched their career by building the Adelphi from the Thames to the Strand in London, which although not a commercial success at the time, included one of London's most cherished buildings, the Adlephi Theatre. Together, the Adam brothers designed and built some of the most famous buildings in England, including such bastions of English architecture as Kenwood House, Keddlestone Manor, and Syon House. To the interiors of their English country houses, the Adams brought wonderful ornamental elements in niches, lunettes, festoons and reliefs. Their classically designed buildings were so numerous in London that they changed the prevailing feel of the city and established their brand of neo-Classicism as the model of elegance and importance. It is asserted that the brothers originated the concept of the uniform facade attached to the typical English row house, an architectural device that distinguishes London buildings. 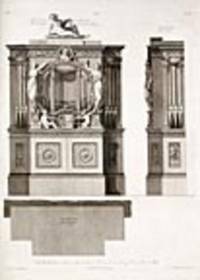 This monumental contribution is evidenced in the Adams' designs for Portland Place and Fitzroy Square, and these were used as architectural models for the whole city. The brothers brought their talents into other areas by designing furniture to complement their beautiful interiors and by creating and publishing a treatise of design entitled 'Works in Architecture'. The work was published in three volumes over an extended span of time, beginning in 1773, with the final volume being published posthumously in 1822. Cf. Brunet I.47; cf. Lowndes I, p.8; DNB; Wilton-Ely, The Mind and Art of Giovanni Battista Piranesi. [London]: Des Barres, 1777. Copper-engraved and etched map with aquatint, hand-coloured, on watermarked: "Bates" laid paper. (Expertly repaired tears). A magnificent 1777 map of the sites of the Revolutionary War battles in and around New York City Des Barres' "Sketch" depicts the entire field of action for the latter half of 1776 in the battle for control of New York City and the Hudson River. 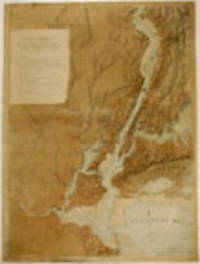 The map, extending from Sandy Hook to Haverstraw, and Jamaica Bay to the western New Jersey establishes in detail the geographical setting for the war as it took place in this region, showing troop positions and strengths, fortifications and battle sites, as well as carefully delineated topographical details, roads, towns, even houses; shoals, banks, soundings in the bay and on the rivers; warships up and down the East River and Hudson. The sites of various embarkations and one of the first American Naval battles: the fire-ship attack on the Phoenix and the Rose are shown. The map also includes an inset of References, which is an index of all the major events from the initial invasion up to and including the battle at Fort Washington. After being forced to evacuate Boston, General Howe brought his army down to Staten Island for an assault on Brooklyn and New York. Howe and his brother, Admiral Richard Howe, built an armada, the largest British invading force in history to that point in time. The Continental Congress had determined that Washington should defend New York, despite the fact that he was outnumbered and his troops inexperienced. It is very much to Washington's credit that though he lost this sequence of battles, he did not lose the war. With the exception of the mistaken defense of Fort Washington, where 2,800 men surrendered, Washington kept his army intact to fight again. This was Howe's biggest chance as most of the Continental Army was at New York. The British invasion began on August 27, 1776 on the southwest end of Long Island. It was, from the British point of view, highly successful, by the end of August 29th, the Americans appeared to be trapped in Brooklyn Heights. However, the Americans quietly and famously escaped, fleeing up Manhattan, while the British slowly pursued them. Washington then left Manhattan for Westchester where he evaded the British until they met in White Plains. There Howe fought a tepid battle and was not able or unwilling to inflict the kind of blow that might have ended the war. After Washington withdrew, Howe returned to Manhattan to take Fort Washington. Cornwallis occupied Fort Lee on the opposite shore. Washington withdrew to New Jersey and then crossed the Delaware to Pennsylvania. These are the events that took place on the geographical setting handsomely portrayed in this fine map. "One of the greatest of the 'Atlantic Neptune' charts, with the best topographical information on the lower Hudson River valley, western Long Island and Staten Island," according to Nebenzahl. Considering the large, elephant folio scope of the map, it is incredibly precise and well-informed. As with Des Barres' greatly esteemed sea charts, this map brings to the study of military events his apparently inexhaustible capacity for detail. The Atlantic Neptune was the first British sea atlas of the North American colonies, and due to Des Barres' synergy of great empirical accuracy with unrivalled artistic virtue, it is considered to be one of the most important achievements of eighteenth-century cartography. Upon the conclusion of the Seven Year's War, Britain's empire in North America was greatly expanded, and this required the creation of a master atlas featuring new and accurate sea charts for use by the Royal Navy. Des Barres was charged with this Herculean task, publishing the first volume in London in 1775, which was soon followed by further volumes. Des Barres' monumental endeavor eventually featured over two-hundred charts and aquatint views, many being found in several states. This is the only known state of the map. This copy with the land elements with original wash colour, the water elements with later colour. Provenance : The Captain "Larry" Sneden house is located in legendary Snedens Landing on the western bank of the Hudson River. The house, an authentic Dutch colonial, was built at an historically important point both before and after the American Revolution. A ferry ran from Dobb's Ferry on the Westchester side to Snedens Landing from the early 1700's through the early1960's. Washington and his troops crossed here during the early days of the Revolution. Nebenzahl 99; Seller and van Ee 1057; National Maritime Museum 122. Essays . sur la recherche de la cause pour laquelle l'estain et le plomb augmentent de poids quand on les calcine. Nouvelle édition revue sur l'exemplaire original & augmentée sur les manuscrits dela Bibliothèque du Roi, & des Minimes de Paris, avec des notes, par M. Gobet. London, 1777. Copper engraving. Engraved by Dom. Gunego. In excellent condition. An elegant engraving of a large organ in the music room at Sir Watkin Williams Wynn's celebrated house in St. James' Square, London. Robert and his brother James Adam forever changed the face of British architecture by introducing innovative Classical design ideas. From 1754-57, Robert lived in Italy where he had a long productive friendship with Piranesi, which was inspirational for both men. Adam's first book, on Diocletian's palace in Dalmatia, is clearly very like the archaeological investigations Piranesi was making at the same time of similar ruins. Piranesi's friendship and passion for Roman Classicism were seminal influences on Adam, and the greatest single factor, other than his own talent, in the work Adam produced on his return to England. Upon his return, the brothers launched their career by building the Adelphi from the Thames to the Strand in London, which although not a commercial success at the time, included one of London's most cherished buildings, the Adlephi Theatre. Together, the Adam brothers designed and built some of the most famous buildings in England, including such bastions of English architecture as Kenwood House, Keddlestone Manor, and Syon House. To the interiors of their English country houses, the Adams brought wonderful ornamental elements in niches, lunettes, festoons and reliefs. Their classically designed buildings were so numerous in London that they changed the prevailing feel of the city and established their brand of neo-Classicism as the model of elegance and importance. It is asserted that the brothers originated the concept of the uniform facade attached to the typical English row house, an architectural device that distinguishes London buildings. This monumental contribution is evidenced in the Adams' designs for Portland Place and Fitzroy Square, and these were used as architectural models for the whole city. The brothers brought their talents into other areas by designing furniture to complement their beautiful interiors and by creating and publishing a treatise of design entitled 'Works in Architecture'. The work was published in three volumes over an extended span of time, beginning in 1773, with the final volume being published posthumously in 1822. Cf. Brunet I.47; cf. Lowndes I, p.8; DNB; Wilton-Ely, The Mind and Art of Giovanni Battista Piranesi. Genera Insectorum eorumque characteres naturales secundum numerum, figuram, situm et proportionem . De l'Ordre social, ouvrage suivi d'un traité élémentaire sur la valeur, l'argent, la circulation, l'industrie & le commerce intérieur & extérieur. SCULL, N. and HEAP, G.
London: Gentleman's Magazine, 1777. unbound. SCULL, N. and HEAP, G.. Map. Copper plate engraving and modern hand coloring. Sheet measures 15.25" x 12.5". 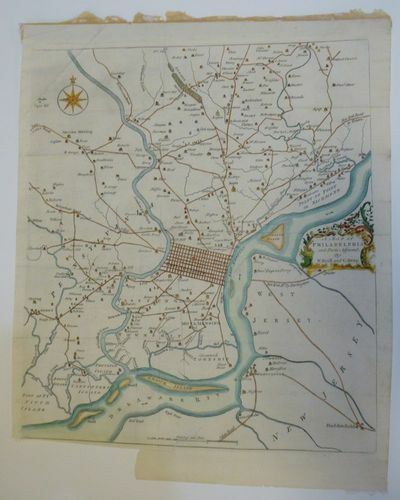 Early map of Philadelphia printed during the Revolution, prominently featuring the Delaware River and surrounding towns. Includes New Jersey border. Portion of lower margin trimmed but does not effect image. Upper left corner crease and remnants of top tape visible, repair to center margin. Published in Gentleman's Magazine which was an English periodical (ca. 1736-1858) notable for containing many unique maps. Rare. Historisch-kritische Nachrichten von Italien, welche eine Beschreibung dieses Landes der Sitten, Regierungsform, Handlung, des Zustandes der Wissenschaften und insonderheit der Werke der Kunst enthalten. London: Pr. for Fielding & Walker by Henri Lion 4to (27.2 cm, 10.75"). 2 vols. I: Frontis., 719,  pp. (lacking list of subscribers); 44 (1 fold.) plts., 7 maps (1 fold.). II: Frontis., , 644, [28 (index)] pp. ; 16 (of 17) plts.. 1777Â–78 First edition, "Newly Translated from the Original Greek, by Ebenezer Thompson, D.D. and William Charles Price, L.L.D." Josephus (b. A.D. 37) provides one of the very few non-biblical sources of Jewish history; the Universal Jewish Encyclopedia, though noting the author's lack of prestige among Talmudic rabbis and his tendency to "omit and add" where he saw fit, says, "Writing a history of the Jews which non-Jews would read and believe, Josephus was an innovator in bringing together references to the Jews to be found in non-Jewish histories" (1942 ed., VI, 200). The 1910 edition of the Catholic Encyclopedia adds that these works are "our only sources for many historical events . . . the value of the statements is enhanced by the insertion of dates which are otherwise wanting, and by the citation of authentic documents which confirm and supplement the Biblical narrative." The two volumes are illustrated with a total of => 69 copper-engraved plates (out of 70 called for), including a number of maps, all engraved by several different hands after the work of various artists. 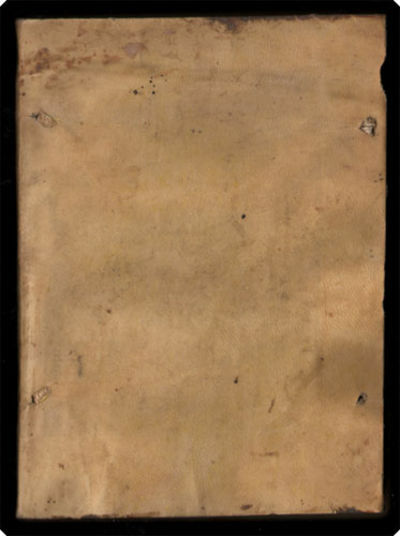 Period-style quarter mottled calf with marbled paperÂ–covered sides, leather edges blind-tooled, spines with gilt-stamped leather title-labels and gilt-stamped compartment decorations. Front fly-leaf of vol. II with 19th-century inked gift inscription. Vol. I lacking list of subscribers; vol. II lacking one plate ("The Death of Caius Caesar"). Light to moderate spotting and staining throughout; some offsetting to and around plates. One leaf torn from outer edge, narrowly missing text. => A sound, handsome set fine for working or playing with. Plan von den Operationen der Koeniglichen Armee unter dem General Sir William Howe - in Neuyorck und Ost-Neujersey gegen die Americaner unter Comando des General Washington, vom 12. October bis 28. November. 1776. wobey vorzüglich die Affaire bey White Plains. am 28. October vorgestellt wird.':. Grundriss des nördlichen Theils der Neujorks Insel - nebst den am 16. Novbr. 1776. eroberten Fort Washington nun das Fort Knyphausen genannt und dem Fort Lee':. Kerkelyke Historie van het Psalm-Gezang der Christenen, van de dagen der apostelen af, tot op onzen tegenwoordigen tyd toe. En inzonderheid van onze verbeterde Nederduitsche Psalmberyminge: Uit echte gedenkstukken saamgebracht. Die Jäger am Ausgang des Waldes, angeblich der erste Versuch des Künstlers. - Radierung, auf festem Velin. 11,1:15,2 cm. - Mit winzigem Rändchen um die Umfassungslinie sowie zwei kleinen Randbeschädigungen. Literatur: Andresen 3, II (von II). 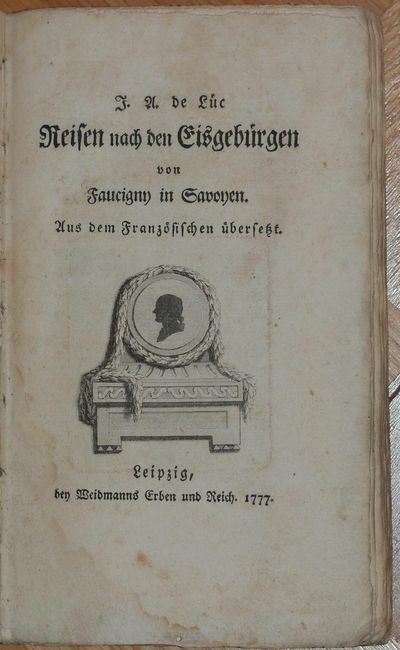 Zunächst studierte Dillis von 1777 - 1781 Philosophie und Theologie in Ingolstadt und München. 1782 wurde er zum Priester geweiht. Anschließend erhielt er Zeichenunterricht bei J.J. Dorner d.Ä. (1741-1813). Seit 1786 erteilte er selbst Zeichenunterricht bei vornehmen Münchner Familien. Durch die Bekanntschaft des Benjamin Thompson Graf von Rumford (1753-1814), der sein Förderer wurde, unternahm Dillis Reisen in die Schweiz und an den Oberrhein. 1790 wurde er Inspektor der kurfürstlichen Bildergalerie in München. Es folgten Reisen nach Salzburg, Sachsen, Dresden, Prag und Wien. 1794/95 weilte er in Rom, 1805 folgte die zweite Italienreise, 1806 war er in Paris und Südfrankreich. 1808 wurde er Professor für Landschaftsmalerei an der Münchener Akademie, 1822 Central-Galeriedirektor. Er wirkte an der Grundsteinlegung der Pinakothek in München 1826 mit und entschied 1834/35 die Auswahl der Bilder für dieses Museum. Mit seinen Freilichtbildern gehört Dillis zu den Begründern der neuen Münchner Landschaftsschule. Nicholas Scull & George Heap 1777 - 34x30cm. Uncoloured. Previously folded and lower left bottom margin closely cut as always. Very good condition. Second state of the reduction of the remarkable Scull and Heap map of Philadelphia, re-issued here during the Revolutionary War in 1777 (the first state published 1753) with additional topographical detail in place of the original table of distances. Reisen nach den Eisgebürgen von Faucigny in Savoyen. Aus dem Französischen übersetzt. Leipzig, Weidmanns Erben und Reich 1777.. Mit Titel-, Kopf ?- und Schlussvignette (alles gestochen). 174 S. Pappband d. Zt. Dreyer 769; Fromm 15615. - Der Schweizer Geologe und Meteorologe Jean-André Deluc (auch De Luc; 1727-1817) berichtet u. a. über die Erstbesteigung des Gletschers Buet. - Gering fleckig. Bamberg und Umgebung, anno 1760, Karte, Lotter T. C.
Histoire générale de PROVENCE, dédiée aux Etats. Nürnberg: C.F.C. Kleemann, 1777. 120, . 8vo. HB. 8vo, cont. boards, front joint partly split but firm, spine worn at foot. Text very good, clean state. Vg. Text German. 1st edition. Very rare. A detailed catalogue in which the caterpillars of butterflies and moths described and illustrated by Rösel and Kleeman are listed by month, together with their foodplants and where to find them. Also with references to the relevant illustrations in Rösel von Rosenhof's 'Der monatlich-herausgegebenen Insecten-Belustigung'. Effectively a second supplement to Rösel's work. [Horn Schenkling 14398]. Albany, 1777. Old fold lines, minor soiling and foxing. Extensively docketed on verso. Very good. 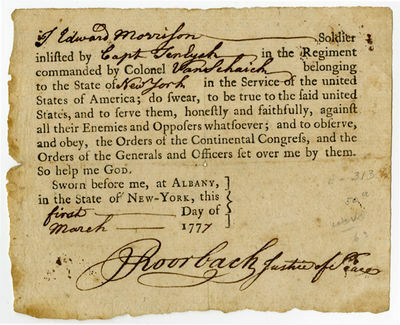 A printed loyalty oath, completed in manuscript, declaring Edward Morrison of a New York Continental Army regiment to be a faithful servant of the United States. The text reads as follows, with the manuscript portions in brackets: "[I Edward Morrison], Soldier inlisted by [Capt Ten Eyck] in the Regiment commanded by Colonel [Van Schaick] belonging to the State of [New York] in the Service of the United States of America; do swear, to be true to the said united States, and to serve them, honestly and faithfully, against all their Enemies and Opposers whatsoever; and to observe and obey, the Orders of the Continental Congress, and the Orders of the Generals and Officers set over me by them. So help me God. Sworn before me, at Albany, in the State of New-York, this [first] Day of [March] 177. [J Roorbach, justice of the peace]". The oath is docketed on the verso by Ten Eyck, certifying the veracity of the person of Edward Morrison, dated March 4th, followed by a note signed by Gen. John Lansing stating that Morrison passed muster the same date. John Lansing (1754-1829) was an Albany lawyer who served for a time as Gen. Philip Schuyler's military secretary, then later as a representative in the state assembly. He was a delegate to the Constitutional Convention in 1787, but left without signing, having become strongly Anti-Federalist and opposed to the centralization of the government. A scarce and ephemeral piece of Revolutionary history. Pennsylvania, Nova Jersey et Nova York, 1760, map, Lotter T.C. Oeuvres. Traduit de l\'allemand. Tome I: Contes Moraux de Mr. D... / Idylles. Mémoire à consulter pour les anciens druides Gaulois, contre M. Bailly, de l'Académie des sciences, par M. l'abbé Beaudeau. Ertappter Briefwechsel von der Zauberey, Schröpfers Künsten, Nativitätstellen, Sympathie, Gespenstern u.d.g. gesammlet von einem Juristen, Mediciner, Philosophen und Theologen und herausgegeben von Erzstein. Von den Ahndungen und Visionen. [Erster und] Zweyter Theil [kmpl.]. Stockholm, 1777. Contemporary plain stiff wrappers. Paper soiled, torn along spine. Early ownership signatures on front pastedown. Quite clean and neat inside. Very good. In a half morocco box. 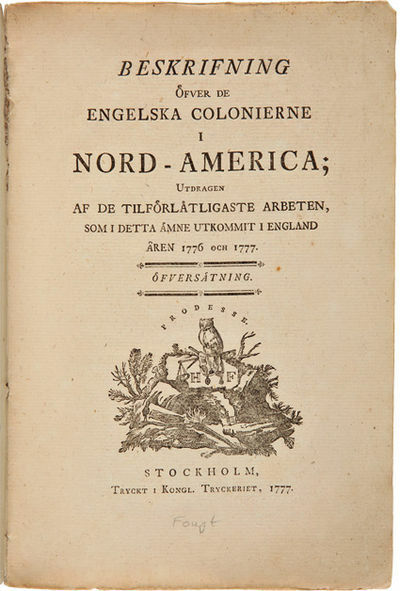 A little-known and scarce Swedish guide to the American colonies, issued in the early years of the Revolution. Each of the thirteen colonies is discussed in its own section, with details on counties and towns, early exploration, colonization and history, climate, inhabitants, and more. The formerly Swedish colony of Delaware gets surprisingly little attention. The very interesting (and apparently quite scarce) Revolutionary map is entitled "Seat of War in America 1777" in English and Swedish, but is otherwise all in English. It has a small inset of the entire East Coast, but the main part of the map shows the region from the Chesapeake Bay up to Massachusetts and New Hampshire. It is a well-drawn map, the focus of which is the location of forts and large landholdings. OCLC locates a total of ten copies. Scarce. CARTAGENA DE ESPAÑA ILUSTRADA; SU ANTIGUA SILLA METROPOLITANA VINDICADA: SU HIJO S. FULGENCIO, DOCTOR, Y SU PRELADO DEFENDIDO. * FUNDACIÓN DE LA IGLESIA DE CARTAGENA, Y SU DIGNIDAD METROPOLITANA, SAN FULGENCIO OBISPO DE SU SILLA Y DOCTOR ILUSTRE DE ESPAÑA. Catalogo de los Obispos Cartaginenses. 2 Tomos. Mars Moravicus. Sive bella horrida et cruenta, seditiones, tumultus, praelia, turbae: & ex ijs enatae crebrae et funestae rerum mutationes, dirae calamitates, incendia, clades, agrorum depopulationes, urbium vastitates, aedium sacrarum et prophanarum ruinae, arcium et oppidorum eversiones, pagorum cineres, populorum excidia, & alia id genus mala, quae Moravia hactenus passa fuit. Josephi Antonii Patinella siculi panormitae regii, pubblici notarii in heraeinorum pastorum academia alpini scriniarii Tyrocinium sive theori-practica Tabellionatus officii in quatuor libros distributa. Editio secunda LEG: CON: Josephi Antonii Patinella. Tabellionatus officii elementa erothematice exposita & juxta ordinem Tyrocinii sive Theori-practicae ejus offici. LEG. CON Constitutiones et ordinationes super officio Tabellionum hujus Siciliae regni ac pandectae. 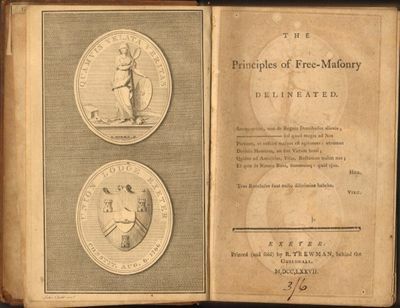 The Principles of Free-Masonry Delineated . Exeter : Printed (and sold) by R. Trewman, behind the Guildhall, M,DCC,LXXVII.  . 0. First edition. A rare provincially-printed guide to Freemasonry, with particulars of meetings and ceremonies held at the Union Lodge in Exeter, of which the compiler was a member. The last half of the book is in verse, in two sections, the first called "Prologues and epilogues, spoken at plays perform'd at Exeter, by desire of the Union Lodge," and the second "A collection of anthems, odes, and songs of Masonry." With an 11-page list of subscribers, mostly from Exeter and other towns in the southwest of England. Original full leather binding. 8vo. 17.8cm x 12cm x 2.4cm. pp.23/[1p. - Errata]/pp.266/[2pp. - Includes a description of the Exeter Union Lodge medal]. Contemporary full calf . Hinges and corners carefully stengthened. Spine with 5 raised bands and original crimson leather title label: "Principles Of Masonry". Printed library label to verso of the front board: "District Punjab, Grand Lodge, Library." Plus armorial bookplate: "E. Libris H. J. Whymper." Engraved frontispiece by John Kirk of London after Brother John Chubb of Bridgewater, includes emblem of the Union Lodge Exeter. Printed title-page with light off-setting. Following the dedication page is a Scantion by the Provincial Grand Master and other Lodge officials. With list of subscribers and a Correct List of the Regular Lodges under the Constitution of England. Clear English text throughout. All pages browned. A good copy of this scarce book. Referenced by: ESTC T105458 ** "Henry Josiah Whymper. 1845-1893An active Freemason in India and a member of Quatuor Coronati Lodge from January 6, 1888, Whymper is remembered today for his reproduction, in facsimile of the Regius MS. According to H.R.H. the Prince of Wales, "He was a man of mark in and out of Masonry, a Companion of the Order of the British Empire, a Masonic Savant and a practical Mason. "Initiated: 1872 . Lodge Mayo No. 1413, Rawul Pindi, Punjab . In 1867 he is first listed as manager, Murree Brewery, Kussowlie Branch. 1870 "Managing brewer" Murree and where he remained as such until his death. Died 27 April 1893, dysentry Bombay N/3/69/364. Buried Sewri, Bombay. Other publications of H. J. Whymper include: The Religion of Freemasonry (1888); Constituciones Artis Gemetriæ secundum Euclydem.?" A facsimile of the early poem on Freemasonry from the original MS. ... [Edited by H. J. Whymper.] (1889); Early Printed Literature referring to Freemasonry. Randle Holme's Academie of Armory, Dr. Plot's Staffordshire, Diary of Elias Ashmole, The Praise of Drunkenness and Long Livers. [Edited by H. J. Whymper.] (1892); A Catalogue of Bibliographies. Lists and Catalogues of Works on Freemasonry. (1891); Triads in Masonry. (1889). " - See AQC Vol. 6. (1893) . .
Ueber den Druck der geographischen Charten. Nebst beygefügter Probe einer durch die Buchdruckerkunst gesetzten und gedruckten Landcharte. 20 S. Mit doppelblattgr. teils kolor. Karte und dem äußerst seltenen, in zwei Farben gedruckten Orig.-Vorderumschlag. 4°. Buntpapier-Pappbd im Stil d. Z.
Leipzig, Breitkopf, 1777. - Der erste der drei Versuche Breitkopfs, Landkarten im Buchdruck aus einzelnen typographischen Elementen herzustellen. "A description of an invention for printing maps with movable type. Breitkopf claimed to have been the inventor of map printing by use of types, or what is known as 'typometry' ." (Bigmore-Wyman 81). "Seine Bestrebungen, die Technik der Druckkunst, deren tiefen Verfall er erkannt hatte, zu heben, sind von Epoche machendem Erfolge gewesen. 1754 gelang ihm der Wurf, den Satz von theilbaren und beweglichen Notentypen . herzustellen . Kurz nach Erfindung der Musikcharaktere entwarf B. den Plan, Landkarten typographisch herzustellen, doch hatte er erst 1777, durch Rivalen angeregt, in der Schrift 'Ueber den Druck der geographischen Karten&#145; hierüber gehandelt. Wohl bewußt, daß eine praktische Verwerthung der Erfindung in großem Stile nicht möglich sei, verwandte er, nachdem der hingeworfene Gedanke eines Schulatlas aufgegeben war, derartige Karten nur als gelegentliche Beigabe zu Büchern und für selbstverfaßte Gelegenheitsscherze, so zur &#130;Beschreibung des Reichs der Liebe&#145;, einem Hochzeitsscherz ." (ADB III 298 f.). Der Orig.-Vorderumschlag mit typographischem Rahmen. In der Mitte eine große, blau gedruckte Holzschnittvignette mit einer Allegorie der Künste. &#150; Gutes, äußerst breitrandiges Exemplar. Die Karte "Gegend um Leipzig" dat. 1776. &#150; Bigmore-W. I 81. Erasmus Roterodamus, Desiderius, [Erasmus von Rotterdam, eig. Gerhard Gerhards]: und Thomas Morus. Morias Encomion [graece] / Moriae Encomomium / Stultitiae laudatio . Desiderii Erasmi Declamatio: Editio catigatissima. Denuo Recognovit A.G.M.Q. [i.e. A.-G. Meusnier de Querlon] Angebunden: De Optimo Reipublicae Statu Deque Nova Insula Utopia, Libri Duo: Autore Thoma Moro, Angliae Cancellario. Opus fincere expressum ex antiquioribus & meioris notae Editionibus collatis: cura & studio A.G.M.Q. Mappa Dell'Universo e de'due pui celebri Sistemi Planetarj. / Tavola Sferica. / Posizione Diversa Degli Abitanti Della Terra. / Planisferio Celeste Settentrionale Tagliato Sull' Equatore. / Celeste Meinale Tagliato Sull' Equatore. Venice: Antonio Zatta. -79 1777 - Together 5 sheets. Each image c. 31 x 41 cm. Variously coloured in block and in outline. The set comprises engravings of a projection of the universe, an illustration of spheres, an illustration describing the locations of the diverse populations of the world and two planispheres (celestial projections from the northern and southern hemispheres). 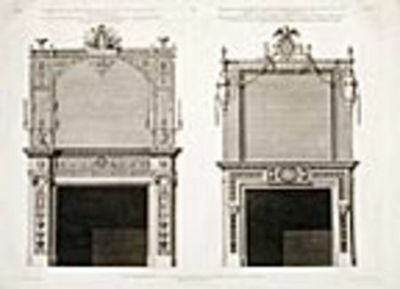 The latter two engravings were drawn by Castellan, embellished by Pittori and engraved by Zuliani. Blank on versos. Light brown diagonal mark to lower left margin of the plate depicting the planisphere of the northern hemisphere, just encroaching onto image. Minor crease to left edge of the other planisphere engraving. Otherwise, the set is in very good condition. Livre D'Eglise Conforme aux Breviaire & Missel de Soissons. Exeter, N.H., 1777. Folio. Antique half calf and marbled boards. Tissue repair to closed tear on first leaf, contemporary ink notations to a few leaves, some fold lines, toning, and edge wear. Uncut, good overall. The first acts of an independent New Hampshire, drawn at the outset of war, and beginning the continuously paginated series of acts and laws that would be issued through 1778. The first imprint (pp. 3-18) contains a total of ten acts, the first establishing law courts for an independent government: "Where as the cruel and unnatural War commenced and prosecuted by Great-Britain against the United Colonies hath rendered it necessary for the protection and security of the Lives and Interests of the Inhabitants of this Colony to assume and establish a new Form of Government therein...." Other laws address courts and legal powers, taxation, voting, highways, credit and currency, and relief of the poor and the mentally unsound. A total of seven additional acts are included in the four additional imprints, including an act encouraging ships to arm themselves for protection of the coastline, one to form a militia, and one to regulate prices, among others. A rare and important series of laws. Carte Nouvelle de l'Amerique Angloise contenant tout ce que les Anglois possedent sur le Continent de l'Amerique Septentrionale Savoir le Canada, la Nouvelle Ecosse ou Acadie, les treize Provinces unies qui sont. les quatres Colonies de la Nouvelle Angleterre 1. New Hampshire, 2. Massachusetsbaye, 3. Rhode-Island, & 4. Conecticut, 5. la Nouvelle York, 6. Nouvelle Jersey, 7. Pensilvanie, 8. les Comtés de Newcastle Kent et Sussex sur la Delaware, 9. Mariland, 10. Virginie, 11. la Caroline Septentrionale, 12. la Caroline Meridionale et 13. Georgie avec la Floride - Gravée exactement d'après les determinations geographiques dernierement faites par Matthieu Albert Lotter à Augsbourg':. Natuurlyke (Natuurlijke) Historie of uitvoerige Beschryving der Dieren, Planten en Mineraalen, volgens het Samenstel van der Heer Linnaeus. Met naauwkeurige Afbeeldingen. 8 Bände von 37 wie folgt: Tweede Deel: Planten. Zevende Stuk - elfde Stuk (vierde Afdeeling): De Kruiden (5 Bände); Twaalfde Stuk: De Bolplanten (vyfde Afdeeling); Dertiende Stuk: De Grasplanten (zesde Afdeeling); Veertiende Stuk : Varens, Mossen, Wieren en Paddesdoelen (VII - X. Afdeeling). Mit zusammen 68 gefalteten Kupfertafeln.